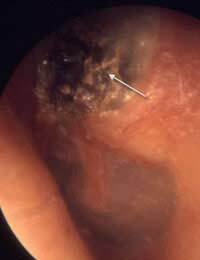 A cholesteatoma is a benign (non-malignant) growth located in the ear, usually deep in the middle ear or around a bony part of the inner ear called the petrous apex. A cholesteatoma can be either congenital or as a consequence of another disorder.Those with congenital cholesteatoma will have been born with this abnormal growth, due to small amounts of skin cells becoming trapped inside the ear during developmental stages. These then form into a growth that they will often remain unaware of until a much later date.Following an infection of the ear, the Eustachian tube and eardrum can become damaged. A blocked Eustachian tube can cause negative pressures causing a vacuum effect sucking backwards the dead skin cells and infection surrounding the eardrum. These products then develop into a growth that can continue to breed infection eventually involving the destruction of healthy bone.The same can occur following a traumatic injury to the ear. The first signs of a cholesteatoma are discharge from the ear and slight hearing loss. As these are symptoms common to many other disorders of the ear, early diagnosis would normally point towards an every day ear infection. Other symptoms can include dizziness, earache and an interference facial muscular function causing a drooping of the face. After diagnosis by your GP, the first stages of treatment will include prescribing anti-biotics, either in the form of eardrops or as a tablet. The doctor will normally want to evaluate the treatment and a follow-up appointment will be necessary, along with visits to the practice nurse for cleaning of the ear. Once the infection has been controlled, a thorough examination of the ear will be made and a referral to an ear specialist or head and neck specialist, will be necessary to determine the size and severity of the cholesteatoma. Many patients will require a series of tests, such as x-rays and scans to help achieve an accurate diagnosis and treatment plan. Surgery may be offered if the growth appears to be large, complicated or encroaching into other areas of the anatomy.The surgery proposed will be to remove the growth and any remaining infectious material, try and restore hearing function and to reconstruct the ear if possible. If left untreated, the infectious material that causes bony destruction can spread to other parts of the anatomy, including other areas in or around the skull and even to the brain. Permanent deafness will be likely if left untreated as the bones of the ear and base of the skull become ‘eaten’ away by the infection.Symptoms of a persistent ear infection should not be ignore as these are very serious consequences. A cholesteatoma is a potentially very dangerous, though benign growth of the ear and skull and should not be left untreated. Surgeons have developed ways of removing these growths without having to penetrate the ear canal, ensuring the best chance for hearing restoration. If your ear infection is persistent and discharge does not reduce after three days, consult your GP where they will examine the ear and make an accurate diagnosis. After my Cholesteatoma Surgery, I loss partial sense of taste. My question is this a normal occurance and is there any treatment for this?